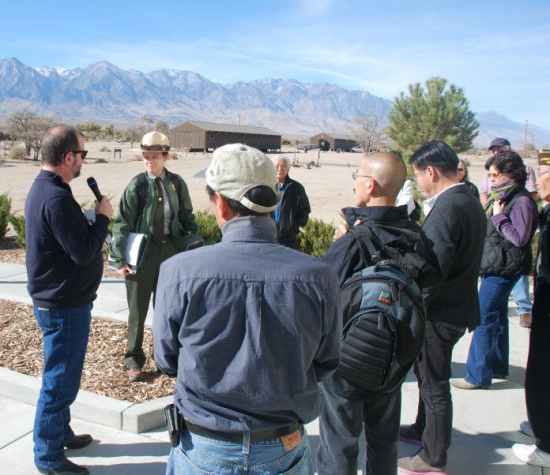 During World War II, 174 men and women confined at Manzanar joined the U.S. military. The event honored them, Owens Valley veterans, and all of those who served. The program began with the presentation of colors by Vietnam veterans from the Bishop Paiute Tribe, followed by a video tribute to all veterans. Opening remarks were given by Manzanar Superintendent Les Inafuku. 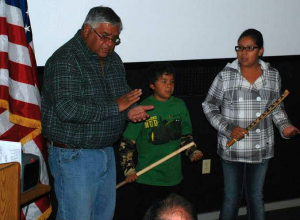 Ross Stone from the Big Pine Paiute Tribe sang with two young family members and read names of Big Pine Paiute veterans. Donna Vaquez of the Bishop Paiute Tribe shared stories of her father, Johnny Manuelito, who was one of the 29 original Navajo Code Talkers. During the war in the Pacific, he helped devise a code that the Imperial Japanese Army was unable to break. Other attendees included Vernon Morris of Barstow, whose uncle, Joseph Morris Jr., was a Code Talker. Dennis Reed of Round Valley, who was among the first U.S. troops to enter Hiroshima after it was destroyed by an atomic bomb, discussed his experiences. He told the visitors that Japanese Americans were incarcerated in places like Manzanar because of racism and propaganda. Photographer/author Tom Graves discussed his upcoming book, “Twice Heroes: America’s Nisei Veterans of World War II and Korea.” He shared some of his insights with a tour group led by Park Ranger Kristen Luetkemeier. Visitors viewed the “Twice Heroes” photo exhibit, which will be on display through Dec. 31. 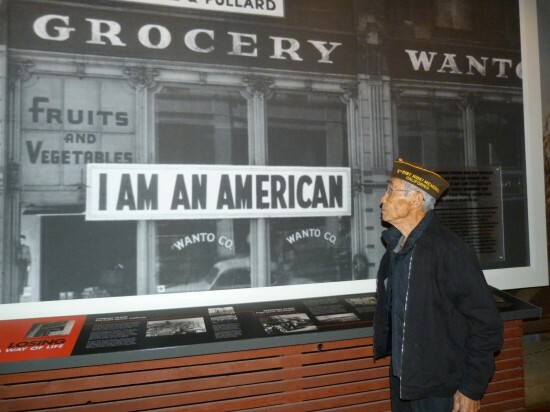 Jack Kunitomi, 97, who was interned at Manzanar and Heart Mountain and served in the Military Intelligence Service, was among the Nisei vets who attended. He is the older brother of the late Sue Kunitomi Embrey, co-founder of the Manzanar Committee and the Manzanar Pilgrimage. Refreshments for the event, which was free and open to the public, were provided by the Manzanar History Association.